Srinagar : The Home Minister Rajnath Singh concluded his 2 day visit to Srinagar today and during the visit about 30 delegates including 8 from different political parties met the Home Minister. 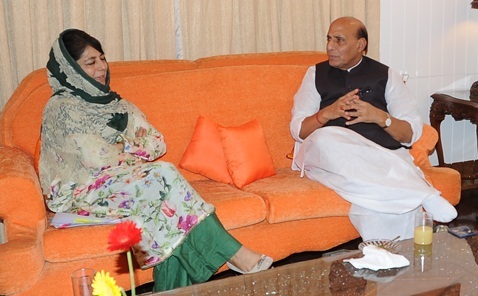 Rajnath Singh also discussed the situation with the Chief Minister of Jammu and Kashmir Mehbooba Mufti, the Governor of Jammu and Kashmir N N Vohra and the State’s Council of Ministers during the visit. He also met senior government officials and security agencies. Rajnath Singh also visited Anantnag today and met civil society delegations. This wide ranging consultations has given the Union Home Minister an on-the-spot assessment of the situation and the views of a cross section of society.